Distance over 8 km - N & W side (edge) of Moor are numerous rock carvings and stone circles dating from the Bronze-Age. The Twelve Apostles Circle (grid reference SE.126 451). Collapsed remains of a large stone circle (now only 12 stones remain) set into a bank some 15m in diameter. The Grubstones Circle (SE.136 447). Kerb of a destroyed cairn (only 20 stones set edge to edge remain). It is a 10m in diameter - the south side having been destroyed. The Horncliffe Circle (SE.134 435). Oval ring of 46 stones set edge to edge, with traces of small inner circle that may have enclosed a burial. Skirtful Of Stones (SE.140 446). Cairn 11m in diameter and 1.8m high. Close by are two earthern circles and, a smaller cairn. The Bradup Circle - on the Keighley side of the moor. 12 stones remain of the 9m circle which originally had some 26 stones all of millstone grit. The stones are small and in an irregular circle in an embanked enclosure. The Bull Stone - towards Otley. Single standing stone 1.8m high having a square cross-section at its base, tapering upwards to a point. This millstone grit stone has not been shaped. It may have come from an outcrop somewhere to the north. Please note I did the above map many, many years ago and don't know whether it is still accurate ? Hi Ray - that is an interesting map. Did you get chance to see the Rivock edge carvings & Bradup Circle? Nope, I last went upto Ilkley Moor in the 60s and sat with my brother and cousin on Cow and Calf Rock. 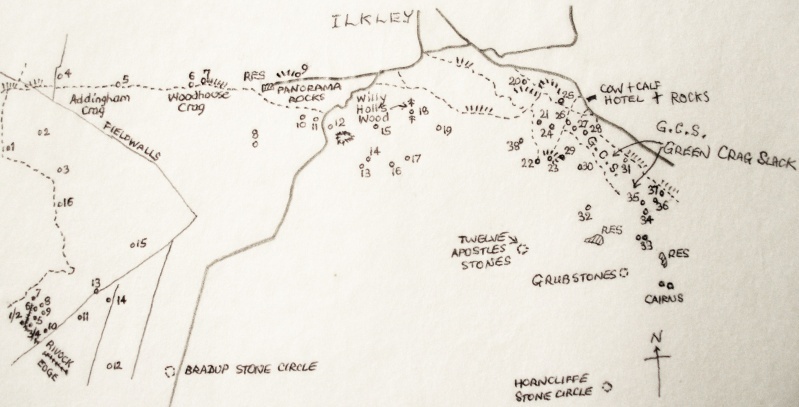 I did visit the moor later, perhaps early 70s and was excited by the stone circles and cup and ring carvings. I then set about doing the map. Can't remember from which book the drawing and info came from - its so long ago now. Shame really. As I said, don't know whether anything has altered with regard to this map. Its probably fairly accurate still. Sunbright57 wrote: Nope, I last went upto Ilkley Moor in the 60s and sat with my brother and cousin on Cow and Calf Rock. I did visit the moor later, perhaps early 70s and was excited by the stone circles and cup and ring carvings. I then set about doing the map. Can't remember from which book the drawing and info came from - its so long ago now. Shame really. As I said, don't know whether anything has altered with regard to this map. Its probably fairly accurate still. It's as good as any other maps that I have seen. Did you publish this in a book then? I think I have seen a similar one too somewhere. Ilkley Moor is a beautiful place. I used to spend a hell of alot of time on them moors. My Mother & Father in Law used to run a youth hostel behind the Cow & Calf Hotel. Unfortunately it was closed down (at short notice) and sold by the Council to a building/property firm & converted into flats. No Mikki the map was in a book, can't remember the books name or author, but would love to know, sorry. I copied the drawing and made it look a bit more interesting. Those numbers not mentioned in the key are cup-marked rocks. I think the map can still be followed quite easily today. Sunbright57 wrote: No Mikki the map was in a book, can't remember the books name or author, but would love to know, sorry. I copied the drawing and made it look a bit more interesting. Those numbers not mentioned in the key are cup-marked rocks. I think the map can still be followed quite easily today. That's a damn good map! Shame that Brad-Up stone circle was mysteriously destroyed. According to all the original reports it was quite impressive. Unfortunate for me, I never got to see it . T'would be good to get a map/records etc (together in a book, maybe) that shows all the destroyed/defaced archaeological remains in the area from the past 25 years. Then we could a least have something to pass on of what was our ancient heritage. Thanks for your kind comments Mikki. I have always liked drawing maps. Started when I was quite young, and still do them today. Sometimes I make one up just for the fun of it, and add churches and castles and lots of roads and footpaths. Sunbright57 wrote: Thanks for your kind comments Mikki. I have always liked drawing maps. Started when I was quite young, and still do them today. Sometimes I make one up just for the fun of it, and add churches and castles and lots of roads and footpaths. No Mikki, anything that appears on TNA is correct, doing little maps of places that don't exist is just something to pass the time. I have done some of the Roman roads across Wales and the Midlands, doubt whether they'd be good enough to put on here though.